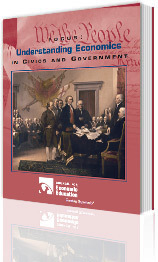 Now, you can give your Civics and Government course a new, active-learning dimension that easily examines the role economics plays in government. Using 20 self-contained lesson plans that are packed with visuals, handouts, data, student activities, worksheets and more, you'll explore explore the role economics plays in government and its influence on political choices. Best of it, these lessons will complement your core Civics and Government curriculum with student-focused activities, simulations, readings and projects. What Is the Role of Government in the Economy? Government Spending: Too Much or Too Little? How Do You Structure a "Fair" Tax System? How Does the Economy Influences Election Outcomes? Is there a relationship between economics freedom and political freedom? What is the role of government in the economy? What about health care? Unemployment? Find answers to these questions and more, as you analyze how economics influenced the United States Constitution, look at key economic cases before the United States Supreme Court, discuss the purpose (and kinds) of taxes, and much more. Sign up to receive updates when new resources and lessons are available.